Sougo mindlessly carries out the orders of a tyrant, before coming to his senses….somehow. Afterwards, he decides to crack down on the biggest threat facing our society – rampant street dancing. Oh and God is here I suppose. The contrast between this pair of episodes is startling, and compelling evidence that it’s not the fundamental idea of Zi-O that’s the problem with it, but rather a lack of effort from the creative side. So while the conclusion of the OOO arc is sludgy, boring and morally dissonant, like the episode that came before it, the beginning of the Gaim arc is interesting, clever, and even slightly provocative. It’s kind of odd to actually be enjoying Zi-O but hey, I’m not going to complain. Before that though, we do need to wrap up on the OOO arc, although I’m not sure that there’s a great deal to say that we didn’t go over last week. The biggest problem remains Sougo’s bizarre allegiance to Dan and his homicidal tendencies, which the show doesn’t even get close to justifying. Sougo claims he’s doing it ‘to see what sort of man he is’ but again, the very first thing we saw Dan do in this serial was unleash a bunch of monsters onto innocent bystanders, followed up by attempting to murder his tailor. I think it’s already pretty clear what kind of guy we’re dealing with here. The situation isn’t helped by the decision to have So Okuno play the entire thing with enthusiastic naiveté that makes his character look like an utter idiot. 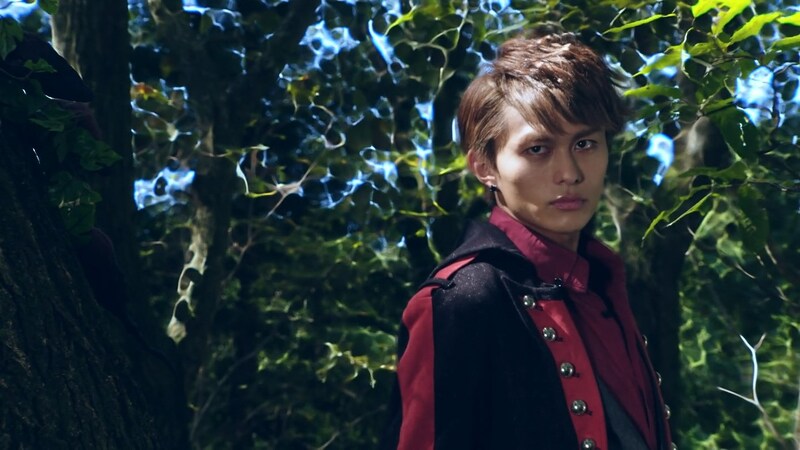 This might have worked if they had played it for character development, showing a deliberately simplistic Sougo gradually coming to terms with the true evil of the ‘king’ he’s thrown his lot in with, but none of that comes across onscreen. Instead Sougo just smugly switches sides once the story decide he needs to, and there’s no indication a lesson is learned. What makes this even worse is that the show throws Geiz under the bus by making him appear as the wronged party who’s too ignorant to understand the grand plan, even though his reaction actually makes perfect sense. I appreciate that they’re taking steps to put Sougo and Geiz back at loggerheads with each other, but it’s such a clumsy and artificial way to do it. Complaining about the acting has been a persistent comment in these blogs, but it really has to be emphasised how much damage it does to any attempt at drama. It’s even more pronounced here alongside the talents of Shu Watanabe, who effortlessly slips back into his character and provides a great blend of easygoing charm with moral fortitude. Even Iro, who has never seen OOO, remarked that Eiji and Hina seem far more interesting and likable characters than our main cast. It’s a good job then, episode 11 came along, because while it doesn’t make huge strides in characterisation, it’s a massive upgrade over pretty much everything we’ve seen before in Zi-O. It helps that it’s based around the much beloved Gaim of course, but nevertheless it’s startling how much of a leap in just the basic technical quality of the show occurs. This is mostly down to two things – an interesting story which plays to the setting’s strengths, and much more interesting, dynamic direction. Let’s handle the story stuff first. Up to this point Zi-O has mostly used the time travel gimmick that the show is centered on either to justify nostalgia, or to weave unnecessarily complex webs around pretty basic narratives. Sure, there’s quite a lot of potential in the Terminator-esque idea of killing Sougo before he turns evil, but for the most part we’ve touched only lightly on that. 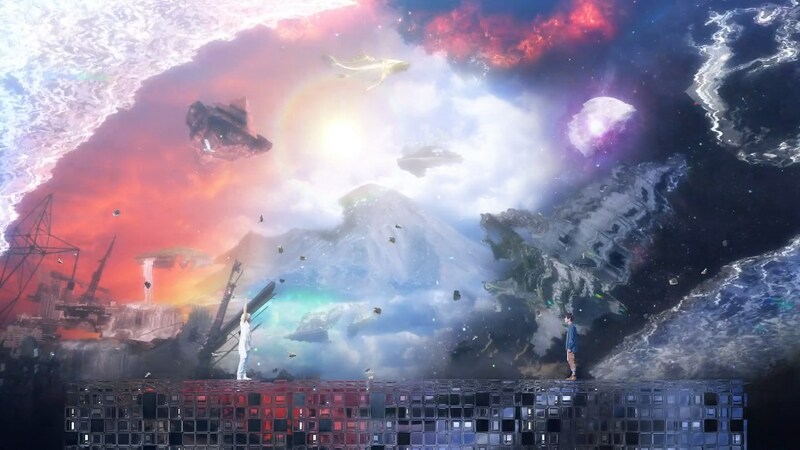 This is really the first episode that has taken the concept that time can be changed and played with to a near unlimited degree and really run with it. So not only do we have two Sougos running around, in some delightfully screwy stable time-loop shenanigans, we’ve also got a fun alternate history behind Team Baron. 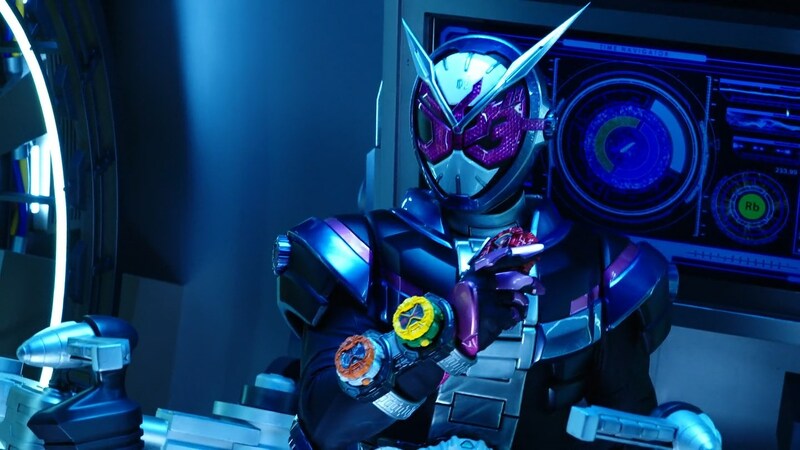 Zi-O has been bad at constructing alternate pasts for the Rider’s we’ve bumped into for the most part (to the extent it’s become a plot hole in a few cases) so while this isn’t exactly in-depth, it’s fun to see Kaito moping around Helheim having been deposed from his beloved troupe. Of course, Gaim also has the advantage of ending with a character becoming a god, which means it’s easier for them to justify some of the shenanigans that happen here. The idea that the ‘original’ Kouta lives outside of time and can continue to exist even as rewritten history creates a parallel version of him is actually impressively high-concept. Furthermore, it also alleviates one of my key criticisms of the show as a whole, because it doesn’t make it feel like the events of the original series were pointless. This has been an issue with pretty much every arc really, but with this ‘cheat’ the show can have its cake and eat it, rewriting the Gaim setting to fit its needs, but still having a meaningful presence from the original characters. Not bad. The other thing which lifts this episode above what we’ve seen before is some smart, imaginative directing. 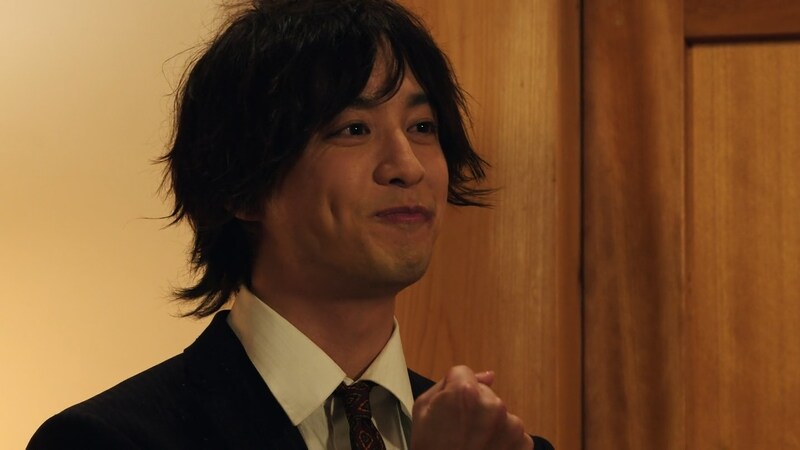 I think it’s fair to say the direction on Zi-O has been workmanlike at best so far, perhaps with the exception of Koichi Sakamoto’s two parter. Even then, Sakamoto is mostly proficient at pure action, and we didn’t see anything like the visual imagination that Kazuya Kamihoriuchi brings to this installment. Scenes like Geiz’s encounter with the Time Jackers among an array of creepy dancing women are more surreal and ambitious than anything we’ve seen up until now, and even Sougo and God Kouta’s conversation overcomes some ropey FX work with smart framing and blocking. It’s not just the big scenes either, with even mundane moments benefiting from more varied camera work and some experimentation with shots and angles – check out stuff like the elevated crane shot as Sougo takes the injured man away, or the closeup of Tsukyomi peeking over the counter. It’s hardly Spielberg, but the increased visual presence really does make the show go down a bit more easily. These two episodes then see the show at opposite extremes, the first among the worst we’ve seen thus far, the latter probably the best. 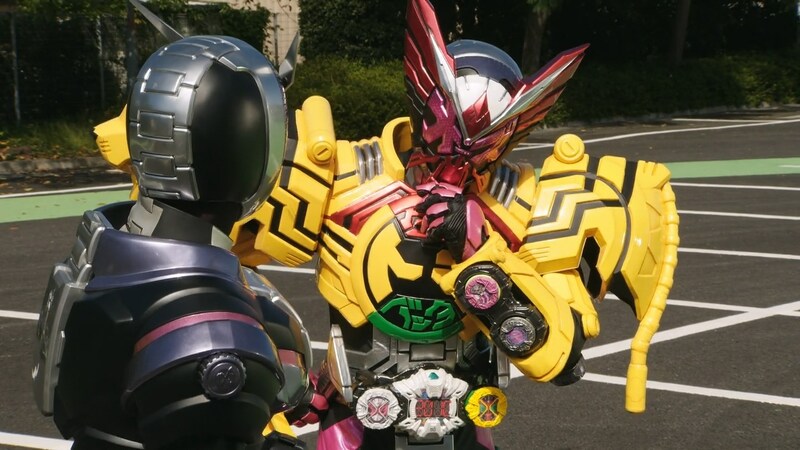 After wading through a lot of crap it’s encouraging to see Zi-O finally put in a strong performance, but we’ll have to wait and hope it’s the beginning of a pattern rather than a one-off aberration. Following on from Uhr’s referencing Ghost‘s Iguana Ghostriker, Hora’s Time Machine takes the form of Castle Doran from Kamen Rider Kiva. Woz prefaces his usual proclamation with ‘Happy Birthday!’, a recurring phrase from OOO. Kaito has apparently survived FIVE YEARS in Helheim without any sort of Rider powers to help him. What’s he been eating? Who’s been doing his hair? The entire performance scene is helped a lot by having an unusually large cast of extras. Unsurprisingly, the Gaim episodes are not written by series mastermind Gen Urobuchi, but by one of his secondary writers, Nobuhiro Mouri. For those of you looking for more Gaim goodness, we covered the entire show on the blog back when it originally aired. Hey, What Happened to Those Kamen Rider Posts? Kaito and Yoko both appear in a crossover between Ex-aid and Gorider( along with Another Agito and Kazuma Kenzaki of Blade). The crossover is surprisingly enjoyable. Honestly, I had no idea it even existed. The number of spinoffs for every series is so high these days it’s tough to keep track of them (They even joked about this in one of the Zi-O net movies).